Okay, so this weekends football game had me way too stressed out. As you all know I'm from New Orleans, so naturally I'm a huge Saints fan. HUGE. My husband on the other hand HATES sports. He'll sit down next to me to watch the Saints game, but he'd rather be doing something else. I know, I know some of you are wishing your husband hated sports so your television would not be consumed with sports all the time.......but trust me mine watches other stupid things that I can't stand to watch, like Mythbusters, How it's Made, oh and not to mention the darn HISTORY channel. Yeah, seriously. If he wants to learn stuff so bad he can turn on one of my shows. Those are "real world" educational. Things he may actually need to know. So I took over the television for the one football game. Let me tell you, I would have preferred to watch his stupid stuff......REALLY. Did you see that game? TOUCHDOWN for the 49ers.........I was like WHATTHEHELLJUSTHAPPENED? Really? I didn't know what to say. I've been really trying not to be a Debbie Downer later and be more of a Positive Patty so trying to think like Patty.........I thanked the New Orleans of Saints for their loss. Thank you Saints for not showing up to play football today. You just saved me hundreds of dollars on Superbowl tickets, not to mention airplane tickets, car rental, hotel........That money will be much better spent on a new pair of heels! It's a win win situation! Right? Well, I made some football cookies. 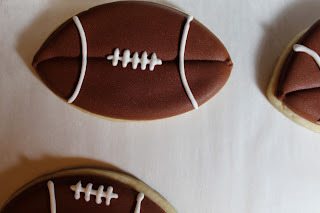 At least if the game wasn't any good, the cookies were. The cookies are always good. They vanish around here. 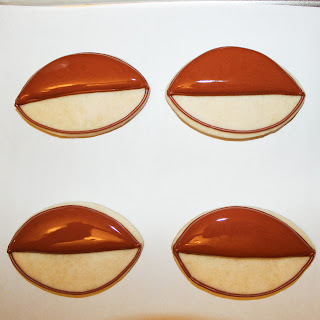 These are really easy to make for a beginner. 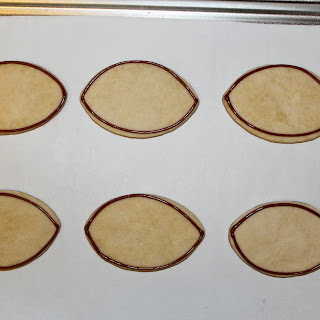 First roll out your dough and cut out football shapes. 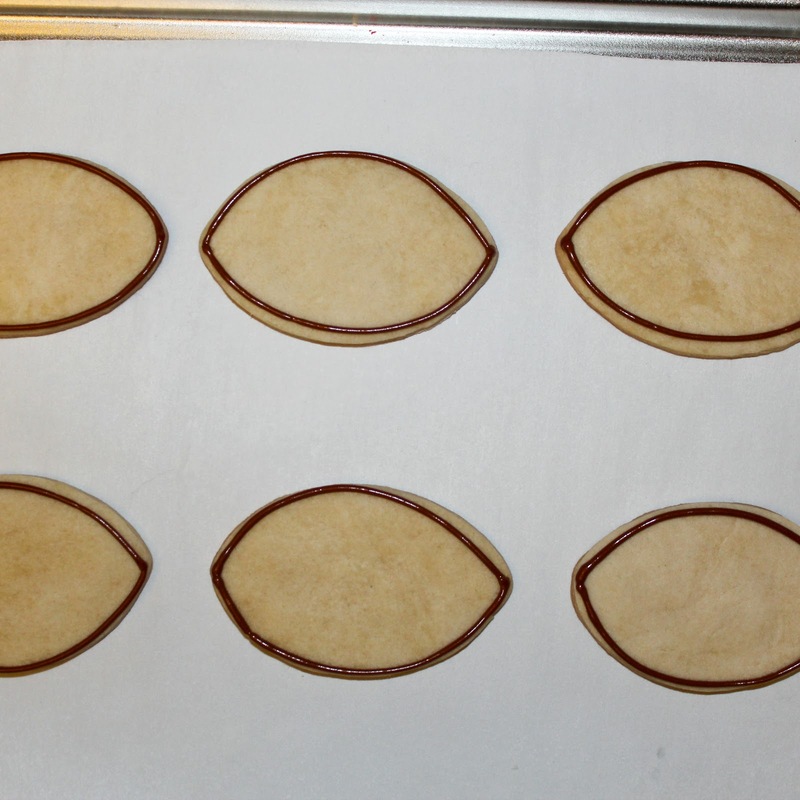 Bake your cookies according to your recipes directions. 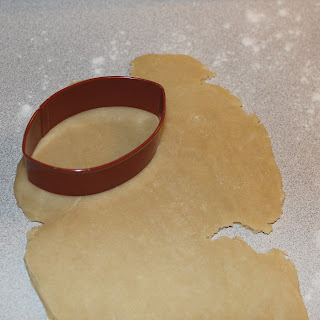 Next outline outer edge of cookie, then add a line down the center. It doesn't have to be exactly straight. Next fill top section ONLY. This will give the cookie definition. I learned this tip from SugarBelle. Go to her blog for some amazing tips! Let the top section dry for a few hours. Then fill in bottom section. Let dry several hours. 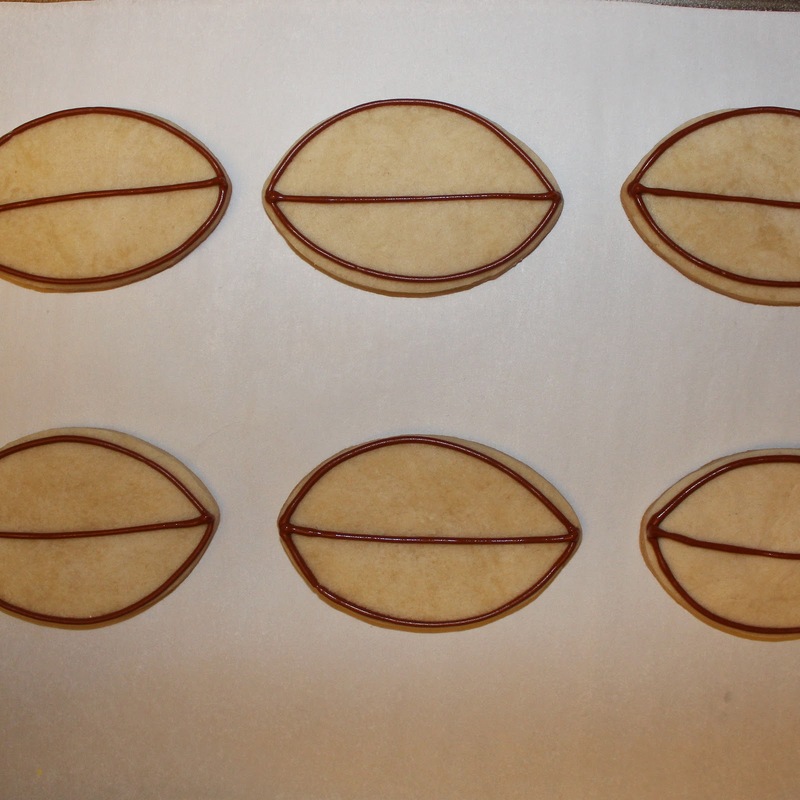 Next add the white details with royal icing and a #2 tip. A #1.5 PME tip would have been better, but since it was dirty and I only own one, I used the #2. Allow that to dry. You can add the laces at the top instead of the middle.....I like this way better. Then enjoy your football cookies at your favorite football game or Superbowl party. Hopefully your team will play better than mine did this past weekend. Your positive Patty spin on the game has me laughing! Your cookies look great. You are so funny! My BF was pretty devastated too! I had a rough football weekend too, Packers fan all my life. We had a good season, but that was a bad way to end it! 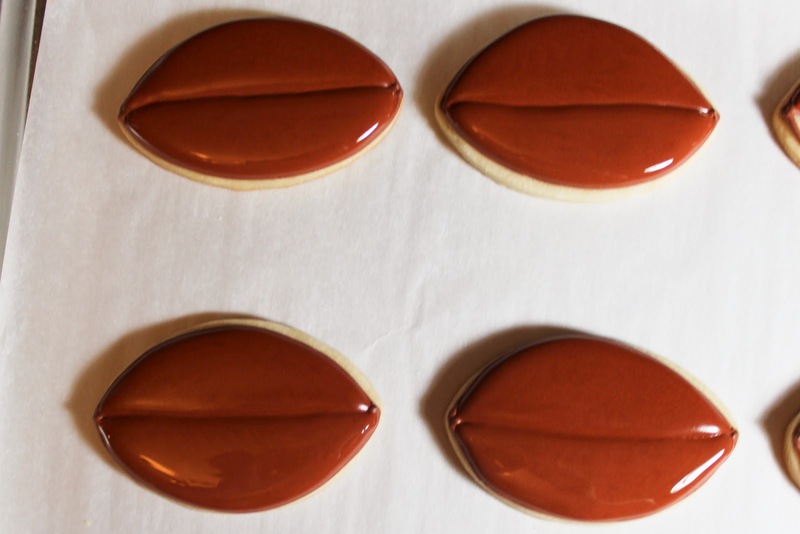 Cookies are very pretty, I like your version of the football. Giselle... I feel your pain. I am a Steelers fan and that's basically what happened to them too! I thought the Superbowl was going to be a rematch of last year's Steelers vs. Packers with a different outcome (sorry, I know you're a Saints fan!) but that is not going to happen. 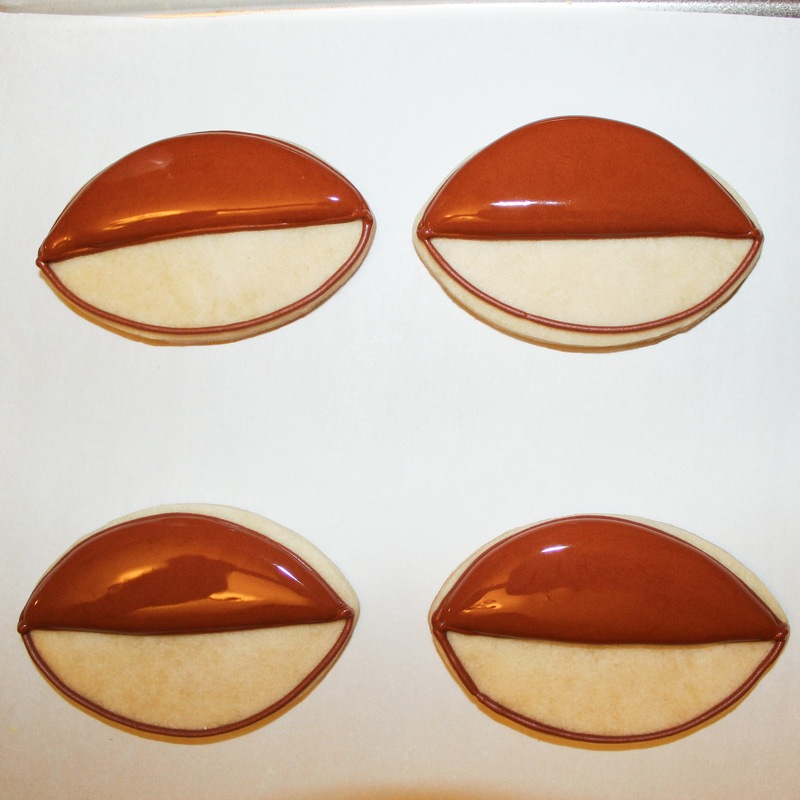 :-/ Anyways... the cookies are cute! Now you can use the money for baby things!!! I feel your pain with the Saints loss, my friend. Good way, though, to look on the bright side of things with the $$$ you saved. I like to think of it as ......if it's between this year or next in going to the Superbowl, I'd rather take next when they can be 'Home in the Dome' for the Superbowl! Can you even begin to imagine that picture!!!! Yes, next year at the Dome would be PERFECT! I'll see you there. Thanks Paula......I had to keep positive in that negative situation. I though I was really going to suffer a heart attack. It killed me to see the outcome. Sorry but I am, OF COURSE, a 49er gal! We are all ready for the big game today and super excited! 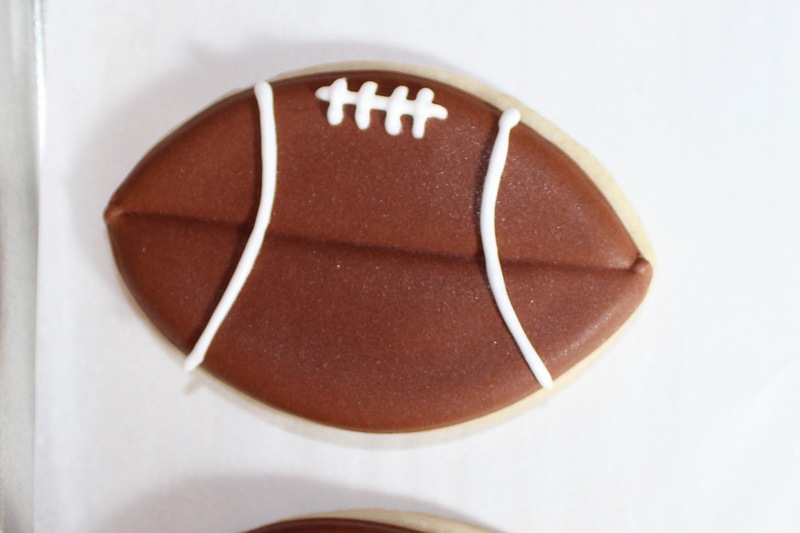 Love your football cookies. 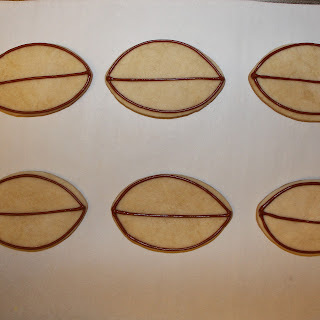 If we win today, I will HAVE to make some for sure! Great tutorial, thanks!